Bangladesh Bank Officer (General) Job Circular 2018 has been published. You can find Bangladesh Bank job circular in My website. Bangladesh Bank Job Notice, Admit Card Download & MCQ Test Exam Result published by Jobs Group 24. All Bank Job Notice is published by Bangladesh Bank Official Website. Know how to apply, See below the more information. You must have to apply Bangladesh Bank Jobs Circular before 20 December 2018. Officer (General) of Sonali Bank Limited(SBL), Bangladesh Development Bank Limited(BDBL), Karmasangsthan Bank and Probashi Kollyan Bank. When You fulfilled complete your Bangladesh Bank application then You have to selected your Written Exam. 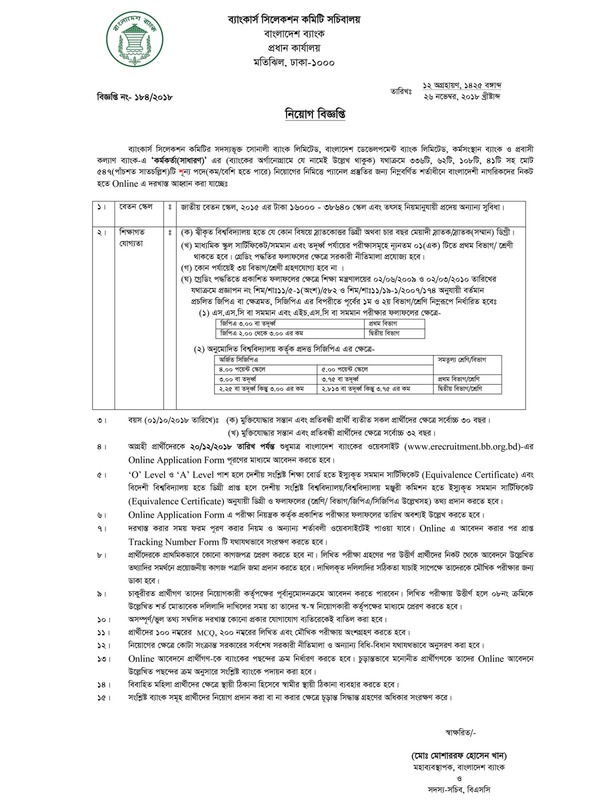 We also published the Bangladesh Bank Written Exam Result to our website. Educational requirement : Four year Honors/Masters degree from any Govt. approved university with at least one first division/class. Third division/class in any examination is not allowed. Bangladesh Bank Job Officer (General) Circular For Apply Bank jobs circular in Bangladesh you have to visit bb.org.bd official website. In this Post, we will give you the Bank jobs Online application link. Check below this post for more information. Apply for Bangladesh Banks Job Please read circular & instruction again. More updates about please visit Bangladesh Banks Career website at erecruitment.bb.org.bd. You can also get all the information about this jobs result, seat plan, exam date, and News at jobsgroup24.com Thanks for stay visit our website.